We often watch Everyday Italian while eating lunch (if we've seen that day's episode of Cash in the Attic that is) & Matt thought this recipe sounded really good. He was right, it was really good & healthy too. We have doubled the amount of vegetables the original recipe called for, I think it would have been a little light on them otherwise. Don't skip on the lemon zest on this one, it really makes this dish shine. 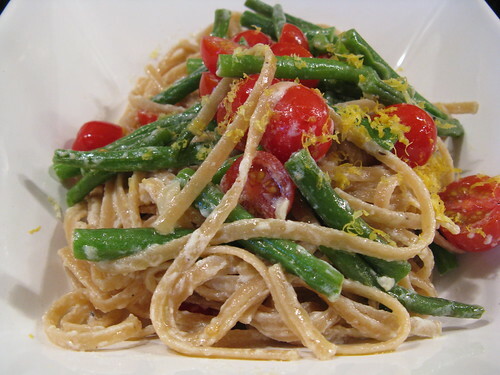 This will be a great summer dish when green beans are abundant at the farmers' market. Cook the pasta until al dente. Drain, reserving 1 cup of the pasta water. Transfer the hot pasta to a large bowl and add the ricotta, tossing to combine. Meanwhile heat the olive oil over medium-high heat in a large skillet. Add the green beans, garlic, salt & pepper and sauté for 4 minutes. Add the reserved pasta cooking liquid and cook until tender, about 4 more minutes. Add the pasta & ricotta to the pan with the beans & toss to combine. Add the tomatoes & gently toss. Top with the lemon zest.